The Spring Into Summer Activities Fair returns Saturday, February 23, 2019 from 10:00 a.m. – 1:00 p.m. at the U.S. Space & Rocket Center’s Davidson Center for Space Exploration. This event is free to the public! Featuring Arts Huntsville member organizations, the Spring Into Summer Activities Fair will highlight spring break and summer camps, workshops and classes in the fields of art, music, dance, theater, science, history and more. The fair will also feature hands-on activities and door prizes. 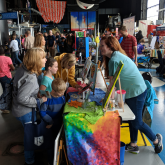 Drawing a crowd of families to the US Space & Rocket Center, the Spring Into Summer Activities Fair offers an excellent opportunity to learn more about educational offerings from local arts and cultural organizations. Follow us on Facebook for the latest event updates! Colors Fine Arts Center, Inc.